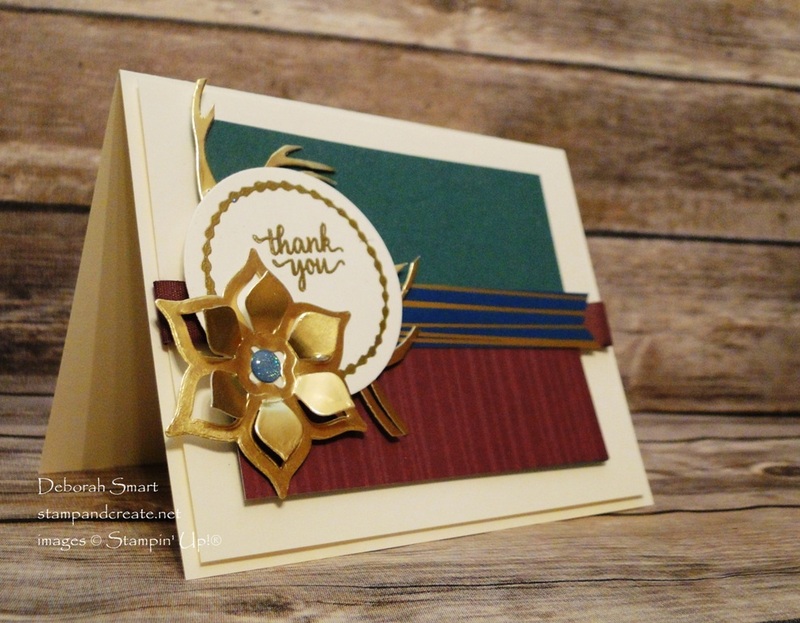 Hello stamping friend, and welcome to a new sketch challenge with the Paper Craft Crew! This week I’m using the Eastern Palace Suite for PCC258; I just love the colours and versatility of this bundle. You can see that there is lots of creative room in this sketch! I can’t wait to see your project! I love bright colours, but the ‘jewel tones’ have long been a favourite of mine. This makes the Eastern Palace Suite of products a must-have for me! On a 4″ x 5 1/4″ Very Vanilla cardstock panel, the Eastern Palace Specialty Designer Series Paper and Tranquil Tide cardstock are layered, with a length of 1/2″ Finely Woven Ribbon in Fresh Fig across the join, and wrapped around the cardstock edges. Another design from the Eastern Palace Specialty DSP, this time with the gold striping, is also cut, with a banner tail snipped at one end. 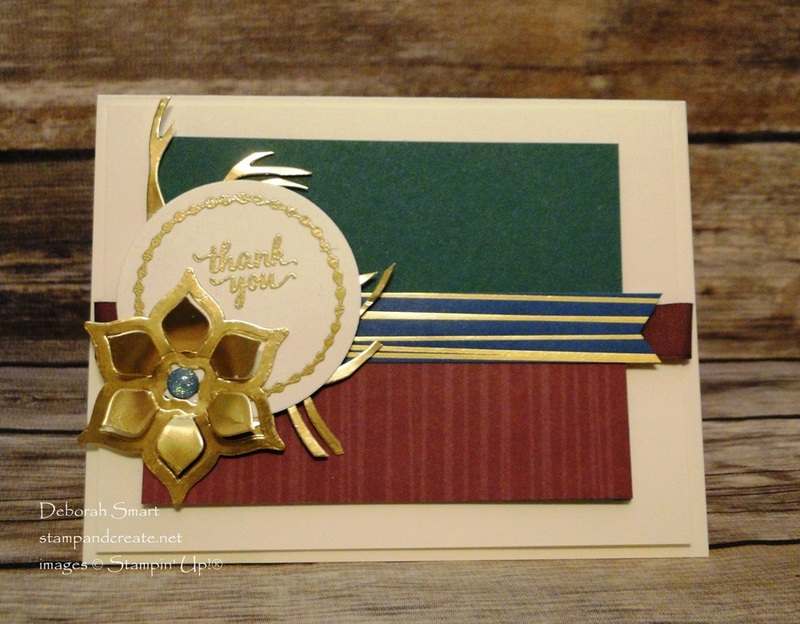 The sentiment and the circle image around it are both stamped in Versamark ink, covered with Gold Embossing Powder, and set with the Heat Tool. I used the Layering Circles Framelits with the Big Shot for die cutting. The Big Shot is also used along with the Swirly Scribbles Thinlits and Eastern Medallions Thinlits for die cutting the shapes in Gold Foil Sheets. Once all my pieces are cut, I’m ready to put it all together! I used my Paper Snips to cut pieces from the wavy portion of the Swirly Scribbles die cut, and attached them to the back of the sentiment circle. The banner of DSP is also glued to the back. Next, that was attached to the panel, with the medallion die cut popped on top, using Mini Glue Dots. I decided I wanted a bit more bling, so I then added one of the Glitter Enamel Dots in the middle of the medallion. I just realized that I forgot to add the 3 embellishments to the right side of the panel!! Okay – just imagine that you see 3 more Glitter Enamel Dots there, please! 😉 Finally, when my panel was complete, it was attached to a Thick Very Vanilla cardstock base. To replicate my card (or create your own!) using the same supplies, click on the images below. You can shop at my online store 24/7! Plus, for August only, anyone placing a $25 or more order (before tax/shipping) using HOST CODE NPSAM4B2 will receive a special gift from me, from the Holiday Catalogue! This is my way of saying ‘thank you’ for staying with me, while I’m away in Scotland! This is a beautiful card, Deborah. I love the Gold Foil flower. A little sparkle is always a good thing! This is so gorgeous! Love those colors. Thanks, Buffy! 🙂 I’m glad to see I’m not alone in liking the rich jewel tones!